In 1908 Winston Churchill declared Uganda the “Pearl of Africa” in his 1908 Book My African Journey. More than a century later, visitors still flock to find this pearl. After our self drive in Uganda, I can’t disagree with Mr. Churchill. The country is filled with birdlife, vast plains, jungle, rolling hills, and some of the friendliest people in Africa. We entered Southern Uganda from Rwanda with low expectations for the country. Sure, they hold the world’s largest population of mountain gorillas – but what else would we find? 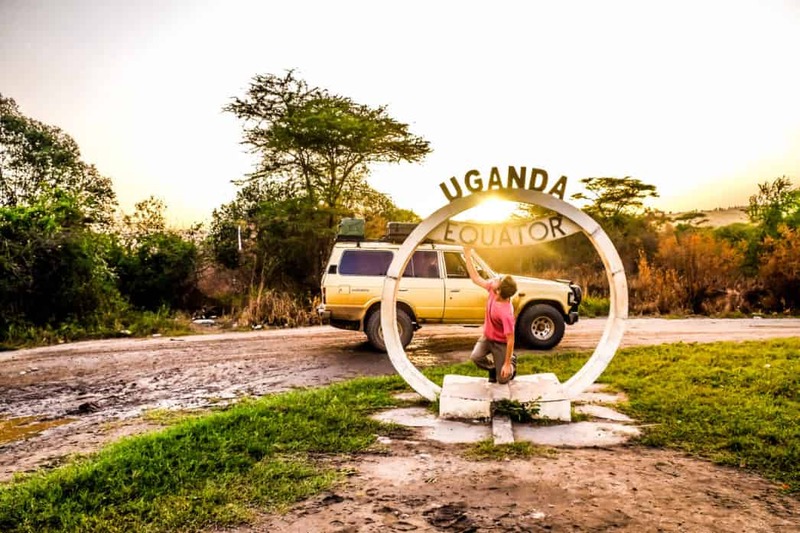 A road trip through Uganda was a highlight of our African road trip. Besides the endless amount of speed bumps, roads are decent and traffic police corruption is low. It’s the perfect country to self-drive, with a rental or with your own vehicle, like us! Here is our self drive Uganda itinerary. 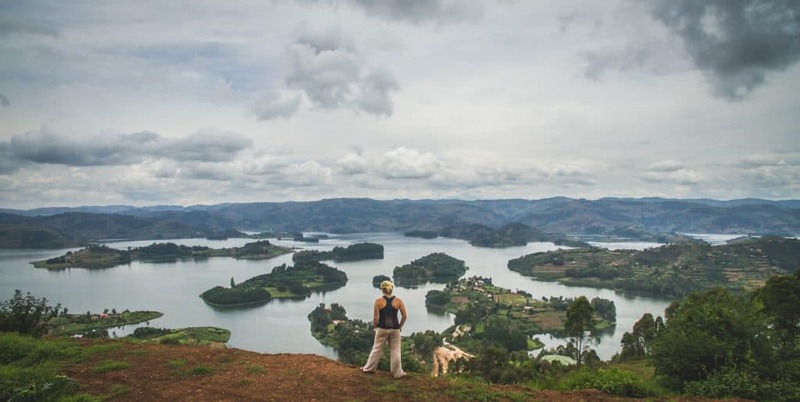 It has been said that Lake Bunyoni may be one of the most beautiful lakes in all of Africa. Now that is debatable, but it is a lovely lake that is perfect to relax on for a few days. Lake Bunyoni was our first stop as we drove up from Rwanda. From the Cyanika border, it took us about three hours through rolling hills to reach our destination by car. A popular thing to do on Lake Bunyoni is to take a small boat around to visit the various islands that occupy the tiny lake. Akampene, Bushara, Kyahugye, Bucuranuka, Bwama, and Njuyeera are some of the more popular islands to visit. Lake Bunyoni is the perfect place if you just don’t want to do anything at all. We found great joy in just sitting with a coffee while overlooking the peacefulness of our surroundings. Bwindi National Forest is famed for its population of mountain gorillas. The UWA offers the unique experience to trek into the forest to catch a glimpse of the critically endangered species. It is a highlight and draws for many tourists who come to Uganda, and one of the most incredible experiences in Africa. Gorilla trekking permits are not cheap at $600 a permit; however, the experience is unforgettable. We trekked high into the Bwindi Forest to find a family of 17 gorillas. Visitors are given an hour with the gorillas to watch the group play, eat, and socialize. Besides gorilla trekking in Bwindi National Park visitors are provided the ability to hike to beautiful waterfalls in the area and enjoy the dense jungle. Where to Stay when Gorilla Trekking? We stayed at the Bwindi Lodge a ten-minute walk away from the park headquarters in Buhoma. 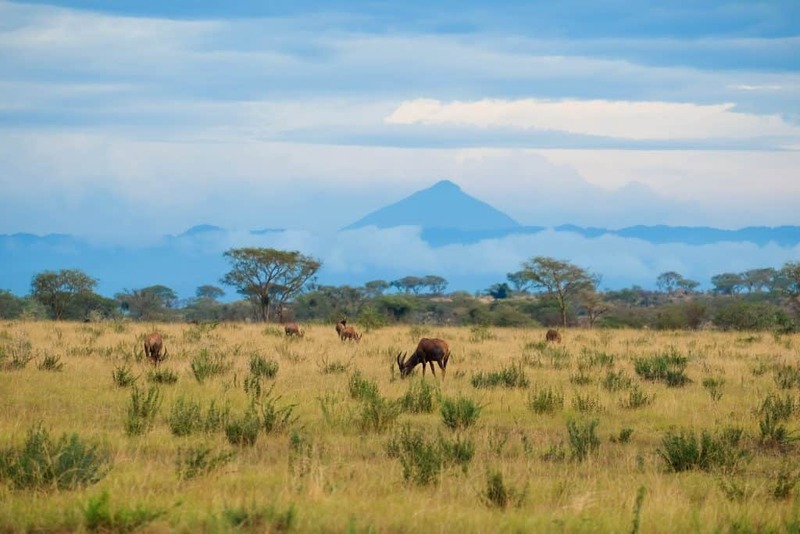 If you are looking to treat yourself I would highly recommend checking out Volcanoes Safaris. For a more budget-friendly option, visitors should look at the Nkuringo Bwindi Gorilla Lodge or Buhoma Community Campsite. Queen Elizabeth National Park is 1978km2 in size. While 95 mammal species and over 600 different species of birds call the park home! Queen Elizabeth is the perfect stop after Bwindi National Park. 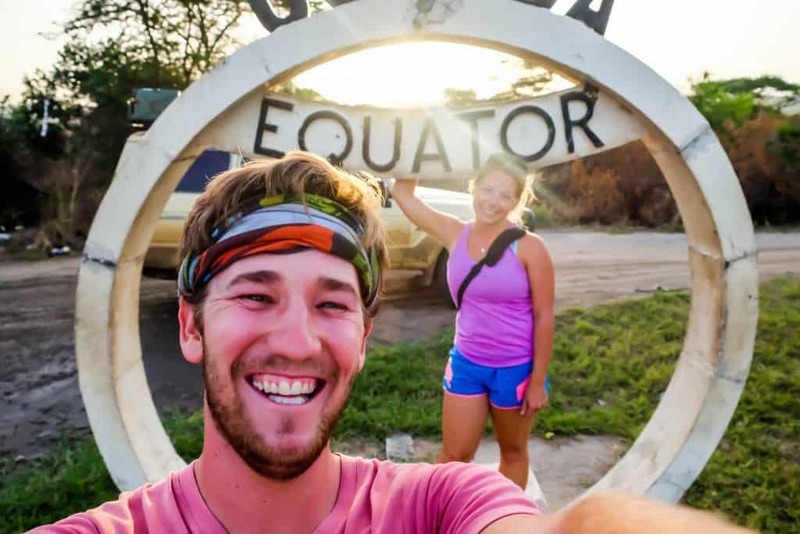 We were expecting a long drive after our amazing day gorilla trekking in Uganda, but instead, we drove just two hours to the southern entrance of Queen Elizabeth. The southern region of the park is known as Ishasha. It is a great spot to go in search of some famous tree-climbing lions. 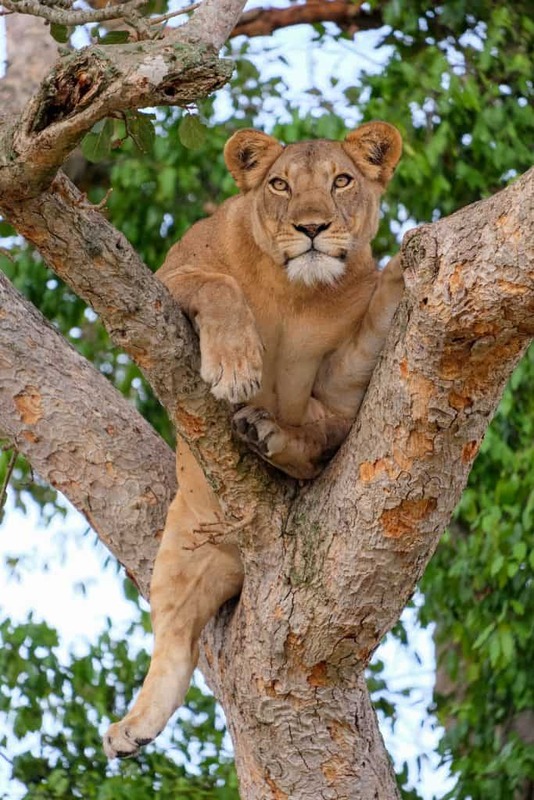 The tree climbing lions only hang out in two places in the world (Tanzania is the other). We went into the park just before sunset and low and behold 30 minutes in we spotted her – a real tree climbing lioness. The next day we self-drove through the park to reach Mweya peninsula. You can self-drive on the main road through the park without having to pay vehicle or park fees. The whole time you stand a chance of spotting of Africa’s famous wildlife. It wasn’t until we hit the Mweya park entrance about 100 km from Ishasha that we officially entered the park and had to present our park passes. We made our way to Mweya lodge for some lunch but found it to be overpriced and went next door to Canteen for a more affordable meal. From there we set out to see the crater lakes of the park. The drive around the crater lakes is one of the most stunning in all of Africa. The pockmarked land with dozens of crater lakes made us feel small. Two hours on the road we never saw anyone else in a two-hour drive along the rim of the craters. We never managed to see much wildlife in Queen Elizabeth, but the tree climbing lions and famous crater lakes made it all worth it. Where to stay in Queen Elizabeth National Park? We stayed at a campsite and lodge called @ the River. 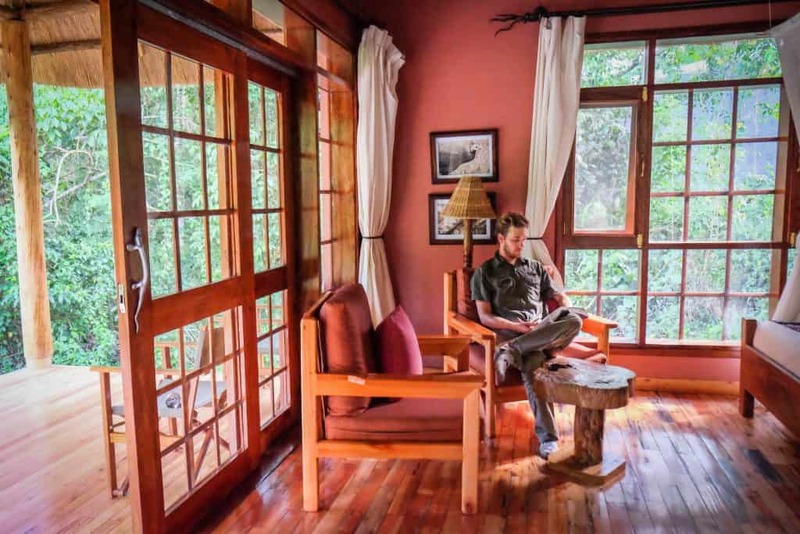 I found the price to be too high for the lodge itself, but it is one of the cheaper places to stay in Ishasha. 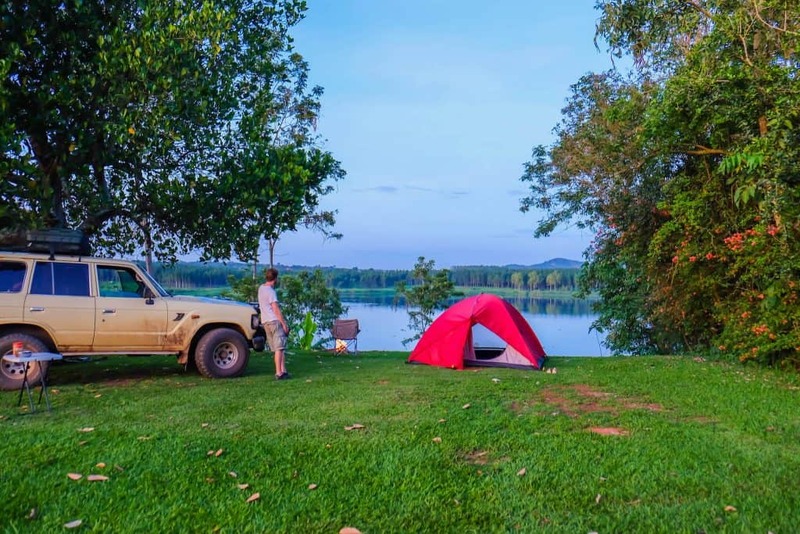 If you are planning to stay at Mweya the Mweya campsite is adequate for a night or two. A more luxurious option is the Mweya Lodge. 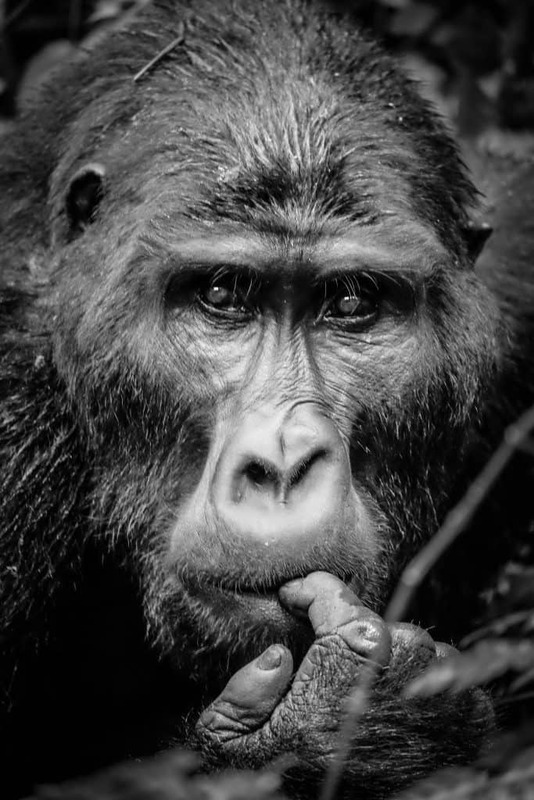 Bwindi may have the mountain gorillas, but if you want to come face to face with our closest living relative head to Kibale National Forest. Located about an hours drive from Fort Portal, Kibale National Forest is the primate capital of the world. With 13 different species of primates, it’s no wonder where they get their name. However, visitors flock here to get an up-close encounter with our closest relative – the chimpanzee. 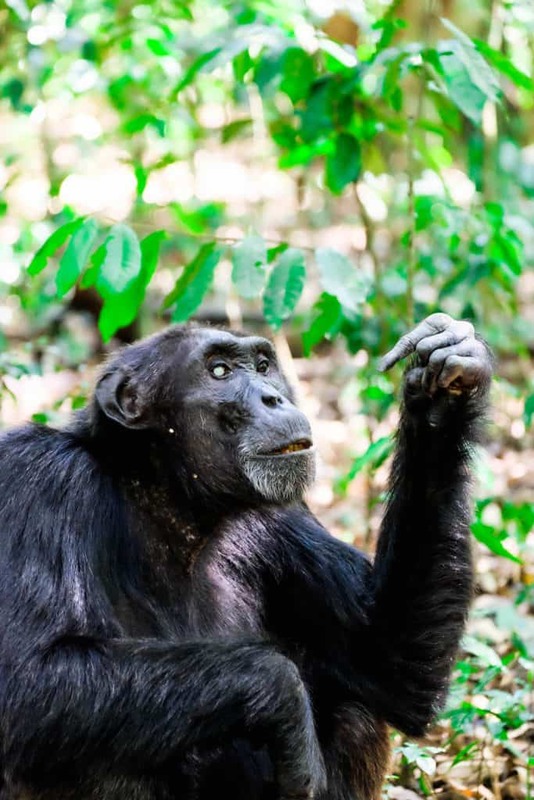 Chimp permits can be organized by the Ugandan Wildlife Authority. 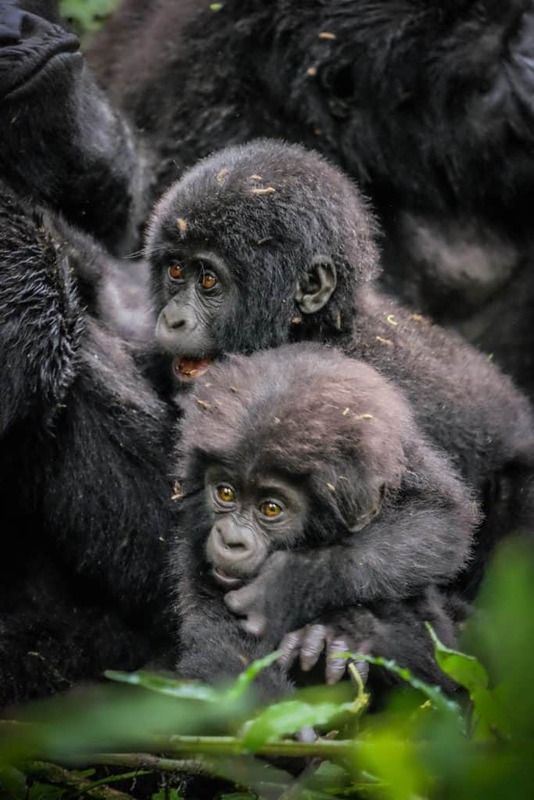 AT $150 they come in as a much cheaper alternative to gorilla trekking in Uganda. It’s advisable to arrange your permits before getting to Uganda; however, we found that people were organizing their trips day of, during the low season. Finding the chimps took us less than an hour and once we spotted the first troop we were able to observe them at a close distance. Visitors are given an hour of observation time with the chimps during which we saw about 20 different chimps. The male chimps are the most habituated to humans and are the least shy group. We heard them call and interact with one another and even caught two grooming! We did see female chimps, but they tended to hang out high in the trees with their young. It’s worth noting that Cameron and I went chimp trekking in the Nyungwe forest in Rwanda, but enjoyed our time in Uganda more. 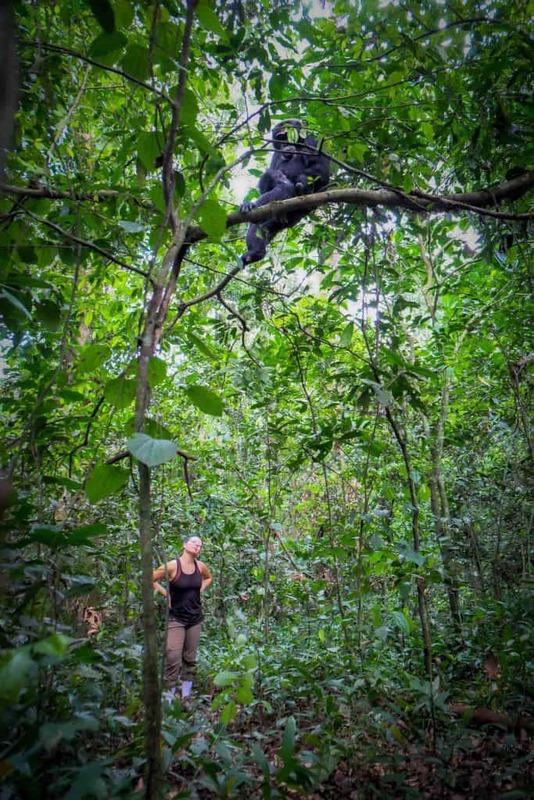 The forest was easier to navigate, trekking the chimps took less time, and we were able to have a better interaction with them in Uganda. That’s not to say that the experience in Rwanda wasn’t memorable though! Where to stay when Chimp Trekking? We decided to park it at the Primate Lodge for a few days in the lush Ugandan forest. Nestled away from the hustle and bustle of life, The Primate Lodge is a five-minute walk away from the Kibale forest entrance. Each of the nine bandas is spread out to allow complete privacy for all guests. All meals are fully inclusive at the Primate Lodge and the food is delicious. The local staff is kind and attentive to all of our meal requests for breakfast, lunch, and dinner. Even dining in the comfort of our own room was no problem at all. We arrived very late at night after getting completely lost in rural African villages and asked the staff if we could have our dinner in our room – at 10 pm. They happily catered to us and understood the long 10-hour drive we had to reach them. We were both so thankful for the kindness of the staff, taste of the food, and overall comfort of the spacious banda. 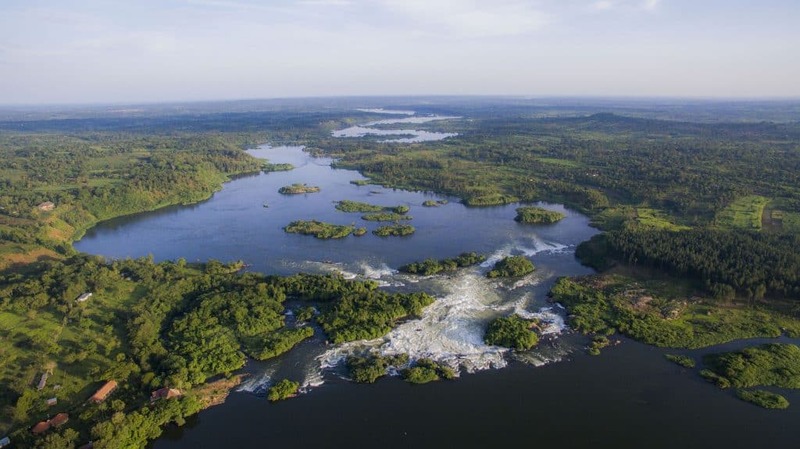 It’s hard to believe that the entire Nile River squeezes itself through just a 7-meter wide gap making Murchison Falls. The waterfall is 43 meters high and makes for an impressive sight to see. 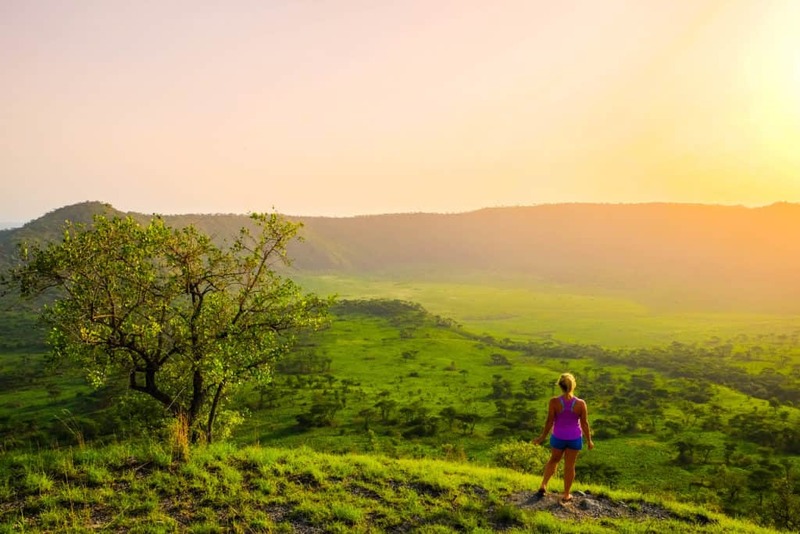 Besides the beautiful falls, Murchison National Park the home of 76 species of mammals and 451 birds. 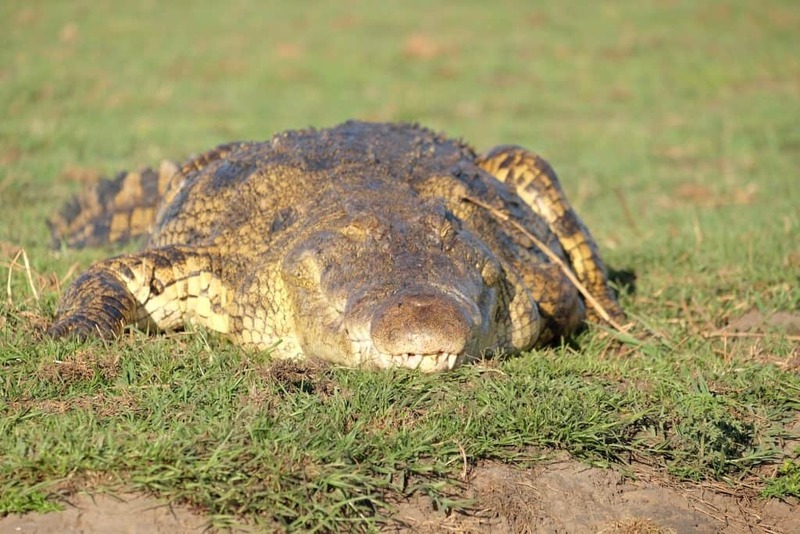 It also holds Uganda’s largest population of crocodiles, so I wouldn’t recommend sunbathing along the river banks. A boat trip to the base of the falls runs visitors $30 per person. Where to stay in Murchison? The Red Chili Rest Camp is a great place to camp while visiting Murchison. They have a full restaurant and more importantly a full bar. Red Chili Rest Camp also organizes safaris into Murchison. We never had the chance to visit Kidepo, but I feel I should give it a special mention as just about every Ugandan we spoke to absolutely loves the park. Kidepo is about as far north as you can get in Uganda and lies right next to Sudan and Kenya. It takes about nine hours to get to from Kampala, making the park isolated. Its isolation is many visitors dream as they will have almost the entire park to themselves to see some of the 77 different species of mammals. 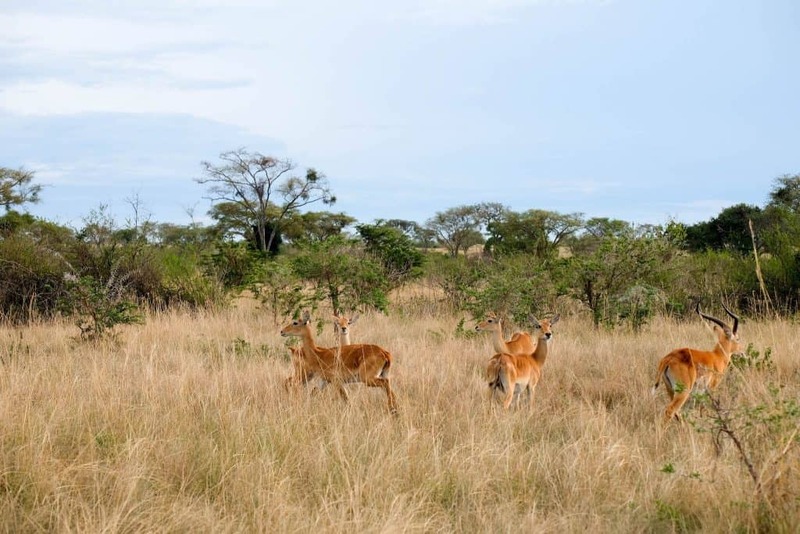 The park is best visited during the dry season when animals flock to the few watering holes near Apoka. Where to stay in Kidepo? The Apoka Safari Lodge is a good place for those not equipped to camp. For those that have their own supplies and are on a budget I would recommend the Apoka Rest Camp. Jinja is dubbed “the adventure capital of East Africa,” and for good reason. The city of Jinja is located at the source of the Nile River. Yes, the worlds longest river starts right in Jinja making it a hotspot for tourist in Uganda. We spent a few days here relaxing on the great Nile River and enjoying some delicious coffee and cafe treats at The Deli. 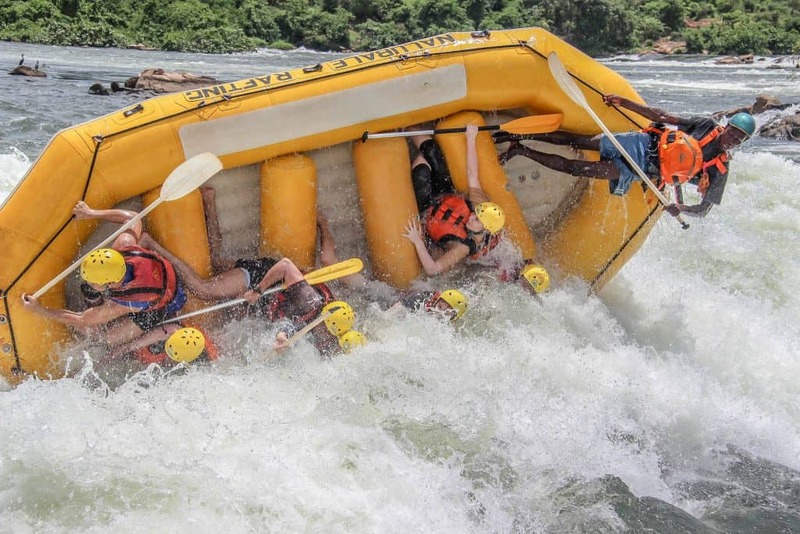 Of course, the highlight of our time in Jinja was white water rafting down the Nile. White water rafting on the Nile is one of the most popular things to do in the country. We chose to spend our day with Nalubale Rafting and started the trip at 9 am near where we stayed – The Haven. Cameron and I were put in a group with five other daring souls from around the world. Our guide, a local Ugandan, was an experienced rafter and spent a good deal of time instructing us on the basics of paddling and what to do in emergencies. I’ve been white water rafting four times now. Twice in the United States, once in Bali, and once in Croatia and I thought I could handle it all. Oh, boy was I mistaken. One tumble out of my raft on class five rapids let me know the adventure was on. We spent the entire day dodging rapids, flipping rafts, and gulping in fresh Nile River water. This isn’t your walk in the park rafting folks – the Nile is serious. Yes, we all lived thanks to the experienced guys and girls of Nalubale who ensured our safety every step of the way. However, after just two flips of the raft all seven of us in our raft were thinking the same thing. Rafting the Nile is extremely fun and I would recommend it to anyone looking for a real adrenaline pumping time in Uganda. If you’re not so prone to water sports then Jinja is also famed for having ATV Quadbike Safaris and bungee jumping over the Nile. Or you can say screw the whole adventure thing and opt for a brewery tour of the Nile Brewery. Where to stay in Jinja? Definitely the top place to camp is The Haven. This was one of the best campsites we found in all of Africa. The bathrooms were clean, the view is incredible, and they even have free WiFi. 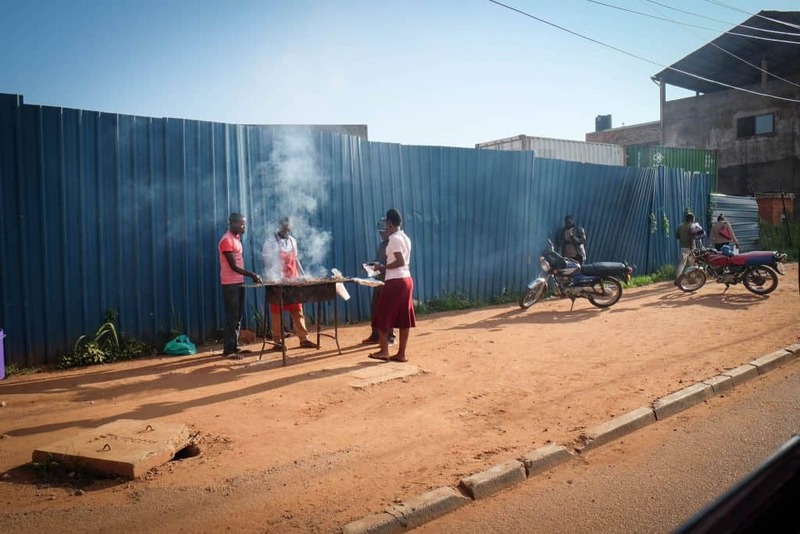 Most trips to Uganda will probably involve the capital city of Kampala, although it’s worth mentioning that the international airport is actually in Entebbe. It will take you at least an hour to get to Kampala from Entebbe unless the traffic is horrendous (which it probably will be). If you are arriving by plane late at night I would recommend staying in Entebbe for the night. We drove through Kampala at 6 pm on a Saturday night and I have to say that it was the worst traffic I have ever been in my life (and we used to live in NYC). I thought it may just have been a fluke night, but a few more drives through Kampala while we trying to sell our truck proved that wrong. The traffic in Kampala is just always a nightmare. To escape the city pollution and traffic I would recommend hanging out in Entebbe. We spent a few days relaxing on the shores of Lake Victoria at the Protea Entebbe. If you are looking for a few days to kill in the area I would recommend heading to the Mabamba Swamp where the famous Shoebill Storks live. Alternatively, take a boat ride out on Lake Victoria or relax in the Entebbe Botanical Gardens. Where to stay in Entebbe? We stayed a few days at the Protea Entebbe Hotel right on Lake Victoria. The hotel is clean and comfortable and is minutes away to the airport (free airport transport too!). If you’re brave try taking a boda boda around Uganda. They are essentially motorcycle taxis best used for short distances. We took them a handful of times just to go short distances, but be warned that they aren’t for the faint of heart. Drivers drive fast and squeeze in and out of traffic. We saw three boda-boda crashes in Kampala – no one was seriously hurt those times. 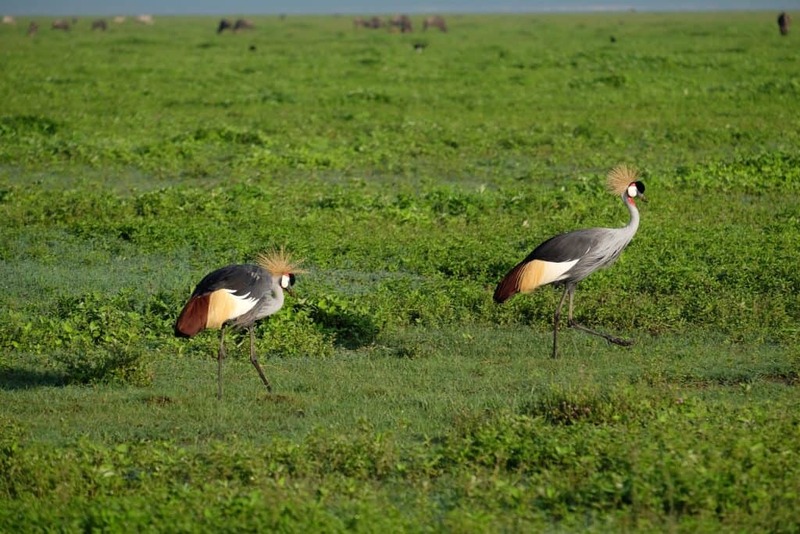 The National Bird of Uganda is the crested crane and can be found on the nation’s flag. Make sure to try a Rolex. A rolex is a rolled up Chapati with whipped egg and various vegetables inside. You can find this on any Ugandan street corner for less than 5000 Shilling. Visas: Americans traveling to Uganda can expect to pay $50 USD, cash only, for a single entry visa. If you have plans to visit Rwanda, Uganda, and Kenya visitors can obtain an East Africa multiple entry visa for $100 cash at the border. Be sure to apply for this visa at least three days ahead of entry online. The Ugandans are friendly people that avoid conflict. No wonder Uganda was named one of the friendliest countries in the world. We never felt threatened in Uganda. Even after sitting in standstill traffic in downtown Kampala at night. However, it is still a developing nation so be sure to use common sense. The national Park Costs for foreign registered cars is insanely high. Non residents can expect to pay $40 per day for park entry and $150 per vehicle per day. The Ugandan Shilling is the national currency. ATM’s can only be found in large towns. Always make sure to carry enough cash on you as credit cards are rarely accepted outside of Kampala. We experienced absolutely no hassle from the police in Uganda. Guess what? We sold our car in Entebbe! Read here to see what that experience was like. Really a great experience you had, i kept reading just to know what happened next. Fortunately you were not disappointed with your safari in Uganda. Self drive safaris can at times get messy for some travelers but luckily you made it and with the way you wrote am sure you had no regret. keep traveling and inspiring many more to discover the world, greetings from the Pearl of Africa.